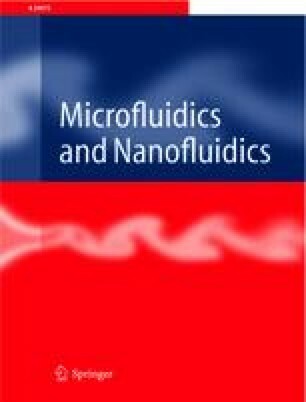 Effective mixing and a controllable concentration gradient are important in microfluidic applications. From the scaling law, decreasing the mixing length can shorten the mixing time and enhance the mixing quality. The small sizes lead to small Reynolds numbers and a laminar flow in microfluidic devices. Under these conditions, molecular diffusion is the main transport effect during the mixing process. In this paper, we present complete 2D analytical models of convective–diffusive transport in parallel lamination micromixers for a binary system. An arbitrary mixing ratio between solute and solvent is considered. The analytical solution indicates the two important parameters for convective–diffusive transport in microchannels: the Peclet number and the dimensionless mixing length. Furthermore, the model can also be extended to the mixing of multiple streams—a common and effective concept of parallel mixing in microchannels. Using laser machining and adhesive bonding, polymeric micromixers were fabricated and tested to verify the analytical results. The experimental results agree well with the analytical models. This revised version was published online in March 2005 with corrections to Eq. 12. This work was supported by the academic research fund of the Ministry of Education Singapore, contract number RG11/02. The first author wishes to gratefully acknowledge the PhD scholarship from Nanyang Technological University.